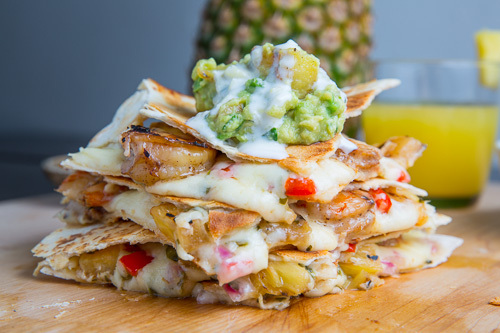 Spicy jerk shrimp quesadillas with sweet and tangy grilled pineapple salsa and plenty of melted cheese served with pina colada guacamole and crema. 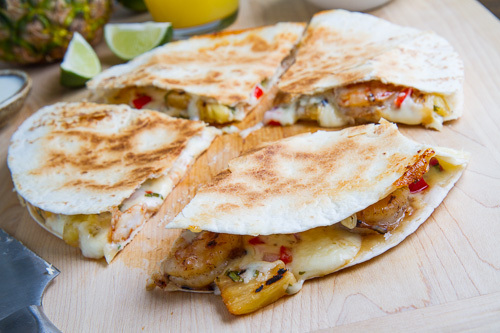 Very often what works in tacos also works in quesadillas and I could not help but think of how good the grilled jerk shrimp and grilled pineapple salsa combo would be all smothered in melted cheese and wrapped in a toasted tortilla! I figured that I would leave it at the nice and simple combo of the spicy jerk shrimp and sweet pineapple salsa along with plenty of melted monterey jack cheese for the filling and that I would serve the quesadillas along with some pina colada guacamole and pina colada crema for dipping or topping. When you have all of the components made ahead of time these quesadillas only take a few minutes to make an they are so unbelievably good! Once again the spicy jerk shrimp and sweet and juicy pineapple salsa work magically well together only getting better with all of the melted cheese! The cool and creamy guacamole and crema play a brilliant counter point to both both the shrimp and salsa really bringing it all home! It looks a lot like a pizza both when it is all assembled and open and after it is cooked and sliced! 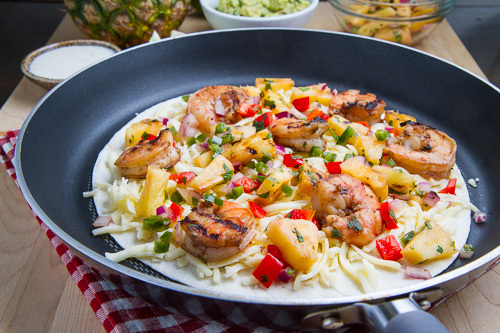 Heat a pan over medium heat, place a tortilla in the pan, sprinkle half of the cheese over the tortilla, followed by the shrimp, pineapple salsa, the remaining cheese and tortilla. Optionally serve with pina colada guacamole and/or pina colada crema. Ahh, the melty goodness of this! I love the ingredient list – so flavorful and everything I'd want in a meal! Need these immediately! Delicious Kevin! Love all of the flavors! I love how you can always take a recipe one step further!! This looks to die for. Holy Yum! I think you just made me change my dinner plans tonight. 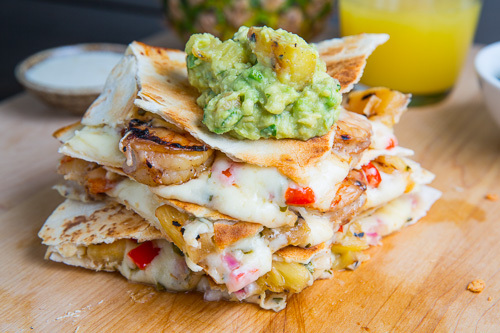 What an amazing combination in quesadilla form! That pina colada guacamole sounds fantastic with this! Look. At. All. That. Cheese. WANT! This is Brilliant, you are a food savant. Wow Kevin!! This recipe looks yummy and so easy!